My annual episode where I take time to express gratitude for the many blessings in my life. What are you thankful for, and have you taken the time to express that attitude of gratitude? Life always has lessons for us to learn--if we are ready to learn them, that is. Listen in for the lessons a nun and a sewing machine were ready to teach me. My life has been going well, and I talk about what's going on lately. I also pay tribute to two actors who were iconic TV "parents." Still re-running classic podsafe music, since the Podsafe Music Network is still down for updates. Some not-so-fun stuff that is not too bad at all. Episode 315-Give Peace a Chance, Please? Recent events in my life have gotten me thinking about creating community to promote and preserve peace. Mommy McGee is out of the house now, and I talk about the lesson in unconditional love that resulted from the visit. For this week's episode, I feature an interview I did with Afizan Aziz, a Facebook friend in Singapore. Afizan talks about life in Singapore, life as a Muslim, and the holiday of Hari Raya. Listen in for an explanation of the title. I share my Labor Day weekend experiences, and wax philosophical more times than I thought possible. Happy 5th Year Anniversary to Ramble Redhead! In honor of his fifth anniversary of podcasting, I wanted to share a special treat from my own show's archives. Over the last four years, I have had the pleasure (?) of doing update shows based on American Idol. This clip is a compilation of some of the more insane moments from the first two years of our having done the update together. Most of this material never made it into the final cut of the episode, while some of it did. I hope you enjoy it, and please visit RambleRedhead.com to check out his show. 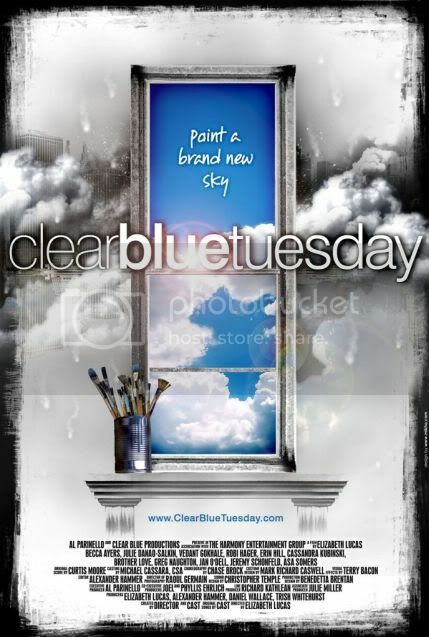 If you are in the NYC area, please check out the new independent movie musical *Clear Blue Tuesday,* starring podsafe musicians Cassandra Kubinski and Brother Love--as well as many other fine actor-singer-songwriters! I can finally discuss the results of the ministerial search, what it means to our church, and what it means to me. This week, I catch everybody up on where things are with the ministerial search--at least as much as I know about it. I also discuss the Prop 8 constitutional challenge, and where we are on that. Finally, I give a more detailed answer to a question about religion asked of me on Fabulis.com. For the last time this season, MIchael and I got together to compare notes on the Season 7 finale of So You Think You Can Dance. Overall, we loved the performances from each finalist, but we agreed on disliking one. Who do we think deserves to win? Listen in, even if you already know what happened. Thanks again to Michael for being such a fabulous co-host, and such a great friend. The show is back to its weekly production schedule. You, my listeners, deserve no less! I catch everybody up on several decisions that were made by me or by others, all of which will affect me to some extent. Michael and I are back once again to discuss what we thought of the Top 4 performances, and who we thought deserved to be in the finale. I sequestered myself from the TV, since we were recording as the results were being broadcast. Michael and I come to you once again to discuss the results of Top 6 week. Who and what did we like on the performance episode? What did we think of the outcome? Find out this, and more on this week's episode! Things in my life are beginning to slow down a bit as the ministerial search nears its conclusion. Mommy McGee is visiting this week and next. Help support Phil Putnam's new album by pointing your browser to rockethub.com and donate today. I reflect on this and more. "Deep Cycle Discharge" by Music Alley artists Simon James and Derek K. Miller Thanks for listening,and Stay Powerful! Episode 300-Fuel for Phil's Rocket! For my 300th episode, I have a treat for all my listeners. Phil Putnam has appeared twice before on my show, each time promoting a new album he had just produced. Now, Phil is appearing before a project even has started, all to let all of us know how we can support and influence that project. Visit PhilPutnam.com to learn more about this great artist and to support him by buying his existing music. Vist RocketHub.com and search for Phil to learn more about "Songs About You," and to become part of the project. On July 4, 2010, I was the guest speaker at the Unity Church of Bay City. In a first for this show, I decided to bring you nearly the entire service, so you can get a sense of how a service can go. Michael and I recorded this update before the results were announced! We knew who and what we liked on performance night, and we also knew who and what we didn't. Which dancers burned the floor? Which judge nearly fizzled out? Find out how we felt about this weeks performances! Michael and I got together to discuss the results of the Top 9. Were we surprised with the results? Is there a judge (besides Nigel) we can't stand? Who inspired us as young, budding dancers? Get the answers to all of these questions (okay, maybe not the last one) on this week's edition of the Update. Episode 296-Give Me Liberty, Or Give Me Chocolate! Update on the ministerial visit schedule. Tribute to a silenced podcaster. Michael and I are back with another results show. We both agree the dancers rule and the judges drool. Michael and I are back for the new season of So You Think You Can Dance. In this post-results episode, we talk about the show's new format, the performances we liked, and of course, how we liked the results. Join us as we celebrate dance and those who love to do it. The Dizzy Feet Foundation has declared July 31, 2010, to be "National Dance Day," a day in which everybody in America is encouraged to get up and dance! In support of this, choreographers Napoleon and Tabitha have put together a simple hip-hop routine that they challenge everybody to learn and do on National Dance Day. I have taken up the challenge. Who will join me? Watch the video below, be sure to practice, practice, practice, and be prepared to dance July 31, 2010! Update on the ministerial search. My recent progress on the ministerial search. The musical is finally moving from inside my mind into the world so that the rest of you can hear it. I'm loving the way the songs sound, and I look forward to getting the whole thing written! The life theme for this weekend is my relationship with children and my regret that I never became a parent. Episode 291-Get Thee Behind Me, Satan! I relate a challenging situation that arose from a comment on one of my Facebook pictures. For the last time this year, Tom and I discuss our favorite show, American Idol. Tom had a sore throat, and yet he did not let that keep him from opining on his favorites and least favorites. Who do we think will be crowned the new American Idol? Listen and find out! Episode 289-Don't Worry, Be Happy! Update on some good stuff going on in my life. For the first time in a while, I am getting political in the aftermath of some of the primary election. Your two most favorite prognosticating podcasters are back! Tonight, we discuss the Top 3 on American Idol and make our predictions for who will make the finale. Stay after the music for a little treat. Episode 287-I'm Back! Miss Me? Catching you up after two weeks away. Lots of stuff going on! First some good news: the Mac Mini is back up and running, so the sound is better this week. Now for some even better news: your two favorite prognosticating podcasters are back and ready to talk about American Idol. Oh, and some other stuff, too. The theme this week was "Songs from the Movies," and the mentor was Jamie Foxx, making him the first mentor to make a return visit. Each contestant did a solo performance, and there were two duets. How did it work? Due to my Mac deciding not to boot up, I was back on the laptop to record tonight. Still, nothing will keep your two favorite prognosticating podcasters from opining about American Idol. This week, the theme was Frank Sinatra songs and the mentor was Harry Connick, Jr.
Who soared, and who flopped? Looks like Tom and I made it and we don't want a week to go by without bringing you another of our critiques about American Idol. Shania Twain was the mentor for the week. How did she do, and how did everybody do? Is this podcast still the one you love? Update on the my role in the search for our church's new minister. On this week of Idol Gives Back the Top 7 American Idol finalists gathered to sing inspirational songs. Tom and I gathered to discuss the performances. Were we inspired? Who left us cold, while who had us cheering? Episode 280-Long Live Julia Sugarbaker! Tribute to the late, great Dixie Carter, aka, Julia Sugarbaker. My own recent Julia Sugarbaker moment at a Chamber of Commerce event. Episode 280-The American Idol Top 9--Again! Tom and I are back to discuss the Top 9 once again. We have a second go around with the Top 9 since the judges used the one and only save to keep Michael Lynche from going home. Who will be the unluckly two going home this week? And what was up with Ryan all episode? Join us as we hash it all out for your aural pleasure! I share the story of a major breakthrough in my life. I also share a controversial, yet I believe beneficial, attempt at urban renewal being practiced in the cites of Flint and Detroit, Michigan. Episode 278-The American Idol Season 9 Top 9-Sorry, Big Fatty! Your two most favorite prognosticating podcasters are back to discuss the Top 9 for Season 9. The performances were markedly better than most weeks. In this special three-part series, I invite you to take an alternate look at the events of Easter week. For this episode, we will focus on the events of Easter Sunday and what metaphysical meanings we can derive from it. Thank you for joining me for this journey. Celebrate your own overcoming today! In this special three-part series, I invite you to take an alternate look at the events of Easter week. For this episode, we will focus on the events of Good Friday and what metaphysical meanings we can derive from it. Note from David: This is a repeat of last year's series of episodes I did for Easter Week. If you've heard them before, I hope you enjoy hearing them again. If you haven't, then they are new to you! Your favorite prognosticating podcasters are back for the Top 10 week of American Idol. Who did we like, who do we think is in trouble, and will the Judges' Save be used? Listen in for our take on it all! Episode 276-Good Stuff Happening All Around! A lot of good stuff has happened in many areas of my life since the last time I did an episode. I share all the good details with you in this episode. Also, I editorialize on the health care reform law, the good stuff that it will mean to us, and the good stuff that still needs to happen. I also appeal to the Tea Partiers and Republicans who seek to challenge change with violence. Your favorite prognosticating podcasting duo is back for the Top 11 week of American Idol. This week, Tom insisted we record immediately after the performance episode ran, because he needed to go to bed. This means, of course that plenty of hilarity would ensue. In other words: Tom is back in all his glory! Your two favorite prognosticating podcasters are back to discuss the performances by the American Idol top 12 contestants. Who did we like, and who do we think is in danger of going home? Listen also for some bonus content at the end...can't call it an Easter Egg if you tell people it's there, can I? This past week was full of challenge after challenge. I can't say I passed all of them with flying colors, but I can say I did survive. Even better, I grew from the challenges. Join me as I share what life brought me this week. Your two favorite prognosticating podcasters are back to share our views on the American Idol Top 16, our predictions of how we thought the results would go, and how it actually went. There was an audio problem with Tom's side of the call, but he actually sounds better that way, don't you agree? According to multiple sources, actor and 80's teen movie icon Corey Haim has died of an accidental overdose. Haim was known mostly for movies such as The Lost Boys and License to Drive and for his early "bromance" with License co-star Corey Feldman ("The Coreys"). Unfortunately, like too many 80's child actors, his early success did not transfer well into adulthood. He did plenty of work, but most projects did not have the same impact as his earlier ones. According to his IMDb profile, he had a series of projects either in production, completed, and had been rumored to have started a couple more. No doubt, these will get some attention as they are released. Haim admitted to drug use for most of his professional life, and he never seemed to be able to overcome addiction for long. It's a sad commentary on Hollywood that too many people like him slip through the cracks and don't always get the help they need. See you on the other side, Corey. Thank you for being who you were in the body. Your spirit is now free to go to its next adventure. My voice was giving out on me, so this will be a shorter episode. I share a fun thing I did in conjunction with my work. Also, I give a quick opinion on the upcoming health care reform process. As always, I welcome comments. Also, don't forget that anybody who listens is invited to do an episode of "David's Salon" with me.Just have a topic--any topic--and get in touch with me to set up a recording time. Your two favorite podcasting prognosticators are back and better than ever before. Listen in as we critique the Top 20 performers and predict which two guys and which two girls will be going home on results night. Listen also for a special surprise from me. You'll love it, I know. My work situation is getting challenging lately.Please think happy thoughts about me, if you will. Thanks! An interaction with a Facebook friend led me to write down some of my feelings about the late Mr. Rogers. I share them with you this week. My "Super Secret Project" is no longer a secret! Check out my performance as a guest reader on the Fear on Demand Podcast as I read the story "The Color of My Wounds." Point your browser here. The Public Option portion of the insurance reform bill is getting some renewed support from the grassroots and from the US Senate. This is great, because it means there is a better chance it will happen. Democracy is not a spectator sport, and we have to make it happen if it is to happen. I'm back with a new personal journal episode! As you may know, I gave a talk at the Unity Church of Bay City. In this episode, I talk about the process of rethinking and rewriting the talk to fit a new situation. In many ways, I was giving the talk I needed to hear. Well, it turns out that my talk I thought was canceled was not canceled after all. In this special episode, I share the talk I gave at the Sunday service at the Unity Church of Bay City on February 7, 2010. This week, some of the plans I made were substituted with a huge life lesson, courtesy of the Universe. Join me as I share what happened, and what I learned about myself. It's gonna be fun, I promise. On the eve of my 40th birthday, I take a look back at the first 39 years and make some decisions about how I will live and love through the next decade and beyond. Oh, and I play some podsafe music, too! Catching up on some personal news that happened during the holidays. Life has offered me some challenges. As we close the books on 2009 and prepare ourselves for 2010, we can make a difference in how our own lives unfold in the new year. I invite you to join me for a That Blue Jeans Guy Podcast tradition as we celebrate the Burning Bowl Ceremony. "Auld Lang Syne Happy New Year" by Mevio Music Alley artist J.E.L.L.i. Thanks for listening, and Happy New Year to everybody!